These people have Ghibtah [i.e. they desire the blessings bestowed on others but do not have a blameworthy envy]. Hasad [envy] in this hadeeth means Ghibtah, but [as for blameworthy] envy, it is to wish that the blessings bestowed upon a person, such as wealth, knowledge and other that, should cease to exist – regardless whether you want to have the same or merely wishing that the blessings be taken away from him. This is a disease of the Yahood [i.e. 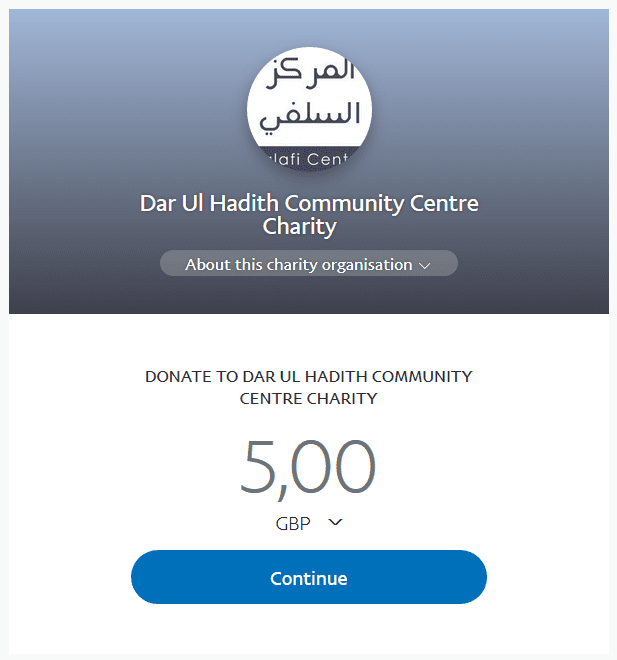 those Yahood who knew the truth brought by the Prophet (sallal-laahu-alayhi-wasallam) but they rejected it out of envy] and we ask Allaah to alleviate [this disease] from the Muslims, for indeed it is destructive disease – and Allaah’s refuge is sought. 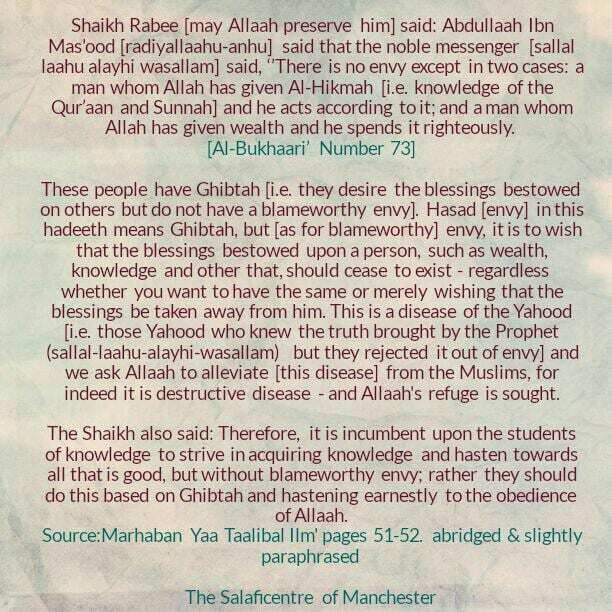 So, the Hasad [Envy] intended in this hadeeth [i.e. the hadeeth of Abdullaah] Ibn Mas’ood] is Al-Ghibtah, which is to wish for the same blessings given to another person [without wishing that he be deprived of it]; for example, Allaah gives a person knowledge and the [ability] to perform good deeds, so you wish that Allaah should also give you knowledge and the [ability] to perform good deeds just as it has been bestowed upon that person. This is Ghibtah and it is praiseworthy. It is a [praiseworthy] striving to excel one another in good deeds. Allaah said: [وَفِى ذَٲلِكَ فَلۡيَتَنَافَسِ ٱلۡمُتَنَـٰفِسُونَ – And for this [i.e. paradise] let (all) those strive who want to strive (i.e. hasten earnestly to the obedience of Allah)]. Therefore, it is incumbent upon the students of knowledge to strive in acquiring knowledge and hasten towards all that is good, but without blameworthy envy; rather they should do this based on Ghibtah and hastening earnestly to the obedience of Allaah. As for striving and hastening towards the Dunyah [against one another], it is blameworthy. [The Prophet (sallal-laahu-alayhi-wasallam)] said: ‘’Do not envy one another and do not hate one another [i.e. blameworthy envy and hatred], do not outbid one another [i.e. do not offer a higher price for a commodity when someone else wants it even though you do not intend to buy it (Ref 1)] and do not compete one another in a blameworthy manner.’’ [Muslim 2563]. All these traits are blameworthy – both in the worldly and religious affairs.